I am collaborating with The Paper Place again for another workshop (or 2) this summer. This time, I will be teaching how to make an anemone paper flower using 180 gram florist crepe. I was never a big fan of these black-eyed flowers until I made them for a bouquet. Now I am soooo enamoured with anemones! They are so fun to make once you get the hang of it. Come to think of it, I like any crepe paper flower that I can make a ton of in just a few hours! It also helps that anemones make any arrangement/bouquet look sophisticated. 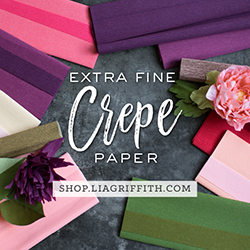 The Paper Place just started making the heavier 180 gram crepe paper available for purchase a few months ago (online and in-store). So for anyone who is not familiar with this type of paper, or you’re thinking to yourself – what would I do with this paper that is so gorgeous in colour and texture??? – it’s a perfect time to learn! The crepe paper anemone workshop will run at The Paper Place (887 Queen St. West, Toronto, Ontario), on August 15th from 6:30 pm to 9:00 pm. Cost is $45.00 + HST*, plus $10 + HST material fee, per person. The crepe paper anemone workshop runs for about 2-2.5 hours, so there will be enough time for me to teach you how to make one anemone paper flower and make one (or two) at the workshop, with enough materials for you to make more at home. Templates will be provided. You can go into the store to register or register by phone by calling 416-703-0089. *For disclosure purposes, a portion of the cost per person is my instructor fee. If you can’t make this anemone paper flower workshop, there’s no need to despair! If there is enough interest, we will run this workshop again in the future, so please let The Paper Place know even if you can’t make it! Also, we are planning on another paper flower workshop in mid-September where I’ll be teaching a different flower.